The diesel engine once seemed ready to have a long reign in the European auto market, seducing buyers with a promise of delivering superior fuel economy and intoxicating torque. Multiple factors caused diesel demand to dip sharply last year, - but experts say the powertrain should not be counted out just yet. Diesel sales are forecast to fall less sharply in 2018 because automakers still need to keep a high percentage of diesels in their lineups to meet carbon emissions requirements, currently 130 grams per km of CO2 for the European fleet. "I don't see a drastic reduction in diesel in the next couple of years but a steady decline," said Pietro Boggia, principal consultant at Frost & Sullivan, who is predicting that diesel sales will fall two to three percentage points in 2018. Al Bedwell, director of global powertrain research at LMC Automotive, expects diesel's market share in 2018 to be just under 42 percent, a decline of three percentage points. "The automakers will need to push diesel sales until 2020 to meet their CO2 targets. The curve is flattening a little bit," he said. Jose Avila, who is head of Continental's powertrain division, said the supplier isn't panicking. "One should remain pragmatic because the situation has not changed dramatically. Our order book for the conventional powertrain is very healthy," Avila added. The diesel's glory days were undone by tightening European emissions standards, consumer skepticism following the Volkswagen Group's emissions-cheating scandal and the threat from multiple municipalities to ban them from city centers. From a market-share high of 55 percent in 2011 (versus 43 percent gasoline), diesel penetration in the 27 European countries tracked by JATO Dynamics has fallen to 44 percent through October -- the lowest share since 2003. The decline has been especially steep in the last year, falling five percentage points, according to JATO. 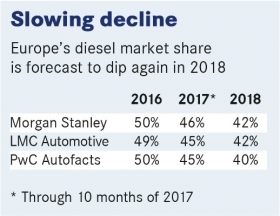 LMC Automotive, which tracks the market in 17 Western European countries, reported a diesel share of 42 percent in October, a seven-percentage-point swing from a year earlier. "It seems the diesel phenomenon is disappearing as fast as it appeared," JATO global automotive analyst Felipe Munoz said. Automakers are scrambling to come up with a powertrain mix that will allow them to meet the next big emissions cut, that takes full effect in 2021, to a fleet average of 95g/km of CO2 -- a figure that nearly all agree will mean significant numbers of electric and electrified drivetrains. That means there will still be plenty of diesels available at dealerships, with automakers motivated to move them along. LMC's Bedwell pointed to a "rebalancing" of the market, especially in France, which accounted for 60 percent of all lost diesel sales between 2011 and 2016. Diesel penetration stands at 48 percent in France, compared with a European high of more than 72 percent in 2011-12, but it fell just 5 percent through October of this year. During the same period, diesel sales fell 12 percent in Germany and 15 percent in the UK. "France was a big driver of lost diesel sales in Europe the last few years," Bedwell said. "I'm not saying there won't be more decline, but a big chunk has already happened." James Verrier, who is CEO at powertrain specialist BorgWarner, told Automotive News Europe that he also doesn't think the diesel is done declining. "We've gone from around 50 percent of overall new-car sales to the mid-40s. Where does it bottom out? Who really knows. It's probably in the 30s." Continental's Avila had a similar prediction when he spoke with ANE. "Our projection is that it will go from 45 percent overall in Europe to something below 40." 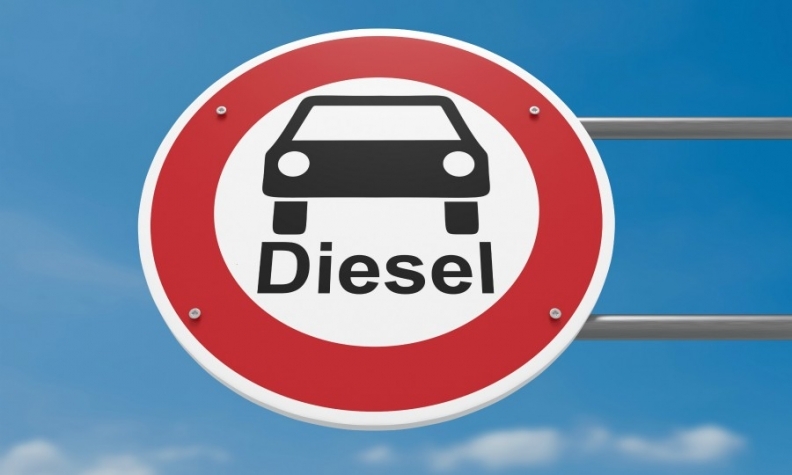 Christoph Stuermer, global lead analyst at PwC Autofacts in Frankfurt, forecasts that diesel sales will settle at 40 percent by the end of 2018, a five-percentage-point drop. He suggested, however, that discussing the European diesel market as a single unit was overly simplistic. "There is no general state of diesel," Stuermer said. "There are increasing doubts about diesel in the German environment, some in the French environment, but a lot of other countries are not yet really impacted by doubts on diesel." Automakers, having invested billions in advanced diesel technology, have vowed to make sure the powertrain doesn't disappear. "Diesel is worth fighting for," Daimler CEO Dieter Zetsche said in July. 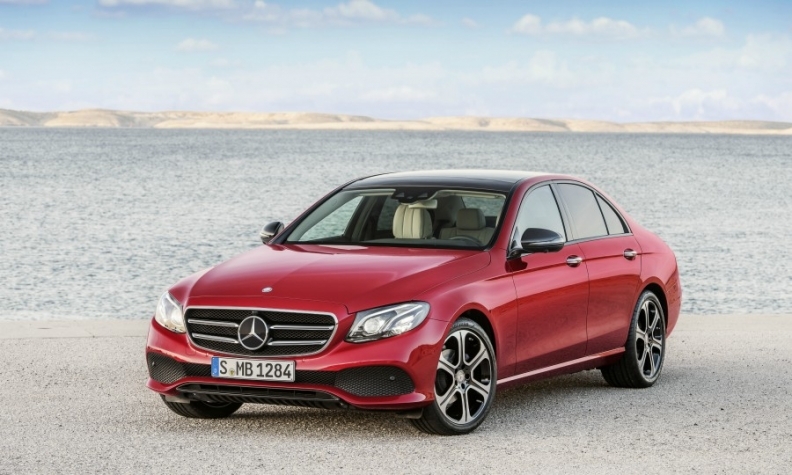 Daimler's efforts to protect the powertrain are paying off at its Mercedes-Benz brand. "Since the beginning of the year, sales of diesel vehicles from Mercedes-Benz in Europe have actually increased slightly compared with the previous year's period," a Daimler spokesman said. JATO Dynamics confirmed that Mercedes's diesel sales are up 4 percent in the period, to 512,622, second-highest in Europe after the VW brand. "To do away with the diesel would be a big mistake from both an ecological and economic perspective," said Mario Muerwald, head of development for diesel powertrains at Daimler. "We are deliberately not committing ourselves to one solitary form of drive system, but to a coexistence of efficient and clean gasoline engines, diesels, plug-in hybrids, battery and hydrogen drive systems." Daimler's new OM 654 and 656 diesels, developed at a cost of 3 billion euros, will appear in more models next year. The engines, introduced in 2016 on E-class models, were engineered to meet Europe's new Real Driving Emissions (RDE) standards for particulates such as nitrogen oxides (NOx). Mercedes's new 4-cylinder diesel premiered in the E220d version of the E class (shown). Mercedes has invested billions of euros in its new diesels to make sure they meet tough NOx emissions limits. Ford of Europe, where diesel sales have fallen 4 percent this year, is introducing its EcoBlue 1.5- and 2.0-liter motors in passenger cars next year, a spokesman said. The engines use selective catalytic reduction (SCR) technology, which is considered more effective in meeting RDE testing standards. "What is happening in diesel sales is changing the landscape very quickly in a way that few if any of us could have imagined, both automakers and governments," the spokesman said. "The fact remains that fuel-efficient, modern diesels remain a core part of our strategy for certain segments." That shifting landscape has forced automakers to be more agile as they re-evaluate production plans and powertrain offerings. For now, most of the lost diesel sales are translating directly into increased sales of models with gasoline engines. PSA, which has seen its percentage of European diesel sales fall to 48 percent this year from 66 percent in 2014, will be importing a reported 100,000 additional three-cylinder PureTech gasoline engines from its Chinese assembly plant to meet European demand. It will double production of those engines at its two plants in France by 2019, a spokeswoman said. "We are adapting our production to meet customer demand and the energy transition," she said. Diesels account for 55 percent of Renault's European sales but under the French manufacturer's new Drive the Future strategic plan, it will reduce diesel families to one from three, equip engines with SCR technology and trim overall diesel offerings by 50 percent by 2022. Renault is facing accusations of consumer fraud in France over particulate emissions along with PSA, Fiat Chrysler and VW, though it has denied wrongdoing. "We expect all the European automakers to streamline their offer to one or two diesel families,2 said Romain Gillet, a drivetrain analyst at IHS Markit in Paris. "They are reducing the diversity costs both in production and engineering. They need to save money due to the high costs of electrification." On the technological side, automakers will be countering the loss of efficient diesels in their fleets with smaller, turbocharged gasoline direct-injection engines, 48-volt mild hybrid systems, and an expected wave of plug-in hybrids, which along with electric vehicles will qualify for so-called "super credits" under the 2020 emissions regime. At the Los Angeles auto show in November, Mercedes debuted its new CLS sedan with a 48-volt system coupled to a six-cylinder gasoline engine that is said to boost horsepower and save fuel. Analysts expect such systems to be common by 2020, with a few coming on the market in 2018. "In the ideal platform rationalization, automakers will keep diesel in the range for higher displacements along with hybrids, and gasoline for smaller displacements and mainstream models," Boggia said. Nonetheless, analysts said the future of diesel is largely in the hands of car buyers, whose concerns include the residual value of diesels, confusion about divergent EU and local regulations, and the trustworthiness of automakers after the VW scandal. "People are starting to play it safe,” LMC's Bedwell said. "If I'm going to lose a significant amount of money or my leasing rate is going up, plus I won't be able to drive wherever I want to, or without paying an extra levy -- then that swings things against diesel."